Malala Yousafzai, From a speech given to the UN Youth Assembly, just nine months after her attempted assassination. 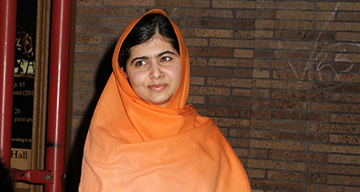 Malala Yousafzai, Harvard, September 2013. Malala Yousafzai, From an exclusive interview with The Guardian's Kamila Shamsie. Malala Yousafzai ( born 12 July 1997) is a Pakistani activist for female education and the youngest-ever Nobel Prize laureate. She is known mainly forhuman rights advocacy for education and for women in her native Swat Valley in the Khyber Pakhtunkhwa province of northwest Pakistan, where the local Taliban had at times banned girls from attending school. Yousafzai’s advocacy has since grown into an international movement.